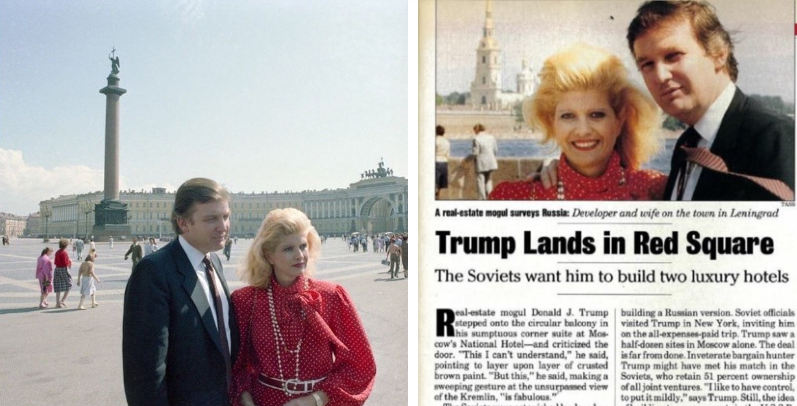 Trump had been wanting to do business in Moscow long before 2015. The above was from a trip he made in the 1980s. According to the article below, which I hadn't seen before, he went back in the 90s. This article says a Moscow development would be his first foreign deal. He actually never brought his casinos back to financial health as you know. It's interesting that the first place Trump wanted to build outside the US was Moscow. It seems to have become his holy grail. I don't know that it means anything especially. Maybe he's just always had an affinity for the place. Which would be fine. Except there is evidence that he benefitted from their interference/sabotage of the US election in exchange for money and/or policy changes and that's not fine. It's possible that they have some leverage on him even today and that's not fine either. And even if he's completely innocent of all that, his ignorance, corruption and malevolence have allowed foreign governments (including Russia) to manipulate him into decisions that benefit them instead of the American people. That's not all on them, it's on equally ignorant and malevolent Americans, particularly the leadership of the Republican Party. These foreign leaders are behaving in a rational manner looking out for their own interests. The US government, under Trump and the GOP, is not.